You're more than our patient. You're our Family! Join Our Family Give Us A Call! Dr. Sunga is a skilled orthodontist and will achieve your desired result through the use of the latest technological advances available. With Clarity ceramic brackets, you'll have a lot to smile about! Clarity can give you the same results without the need for metal braces. Invisalign treatment uses a series of virtually invisible, removable, and comfortable aligners that allow you to smile more during treatment as well as after. Using this fast, safe, and easy-to-use appliance, you'll be finished with your orthodontic treatment and achieve your desired smile faster! Since 2005 Sunga Orthodontics has been servicing Eastlake, Chula Vista, Bonita, and other nearby areas of San Diego. Our top priority has been to provide an exceptional patient experience through state-of-the-art treatment combined with caring and friendly service. Dr. Elaine Sunga and our team take pride in providing each person who enters our doors with treatment and care that will address each individual’s unique needs, with unparalleled service. We offer many types of orthodontic treatments ranging from traditional metal braces to Invisalign®, all customized create beautiful smiles. Please contact us today to learn more or to schedule your FREE smile-assessment! 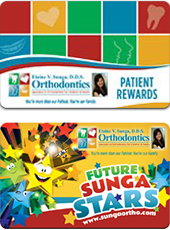 Sunga Orthodontics is the best choice for your orthodontic care and needs! Imagine earning points for being a great patient and having a great smile! With Sunga Orthodontics, you get to join a membership club of lucky users who earn points for doing all kinds of awesome things. And the best part is that you get to use your points to play games, order gift cards and more!